The SV200 series has been discontinued. Please see the SV6000 series as a possible alternative or contact our Flow and Level Engineering department. The SV201 and SV202 are direct-lift valves, which combine the features of a direct-acting valve with those of a pilot-operated valve. Because of a flexible link between the solenoid plunger and the diaphragm, the direct-lift valve functions as a direct acting valve at low pressures and as a pilot-operated valve at high pressures. It is sometimes referred to as a zero delta pressure valve or a hung diaphragm valve. The SV203 through SV207 are pilot operated solenoid valves. These valves use the energy stored in the pressurized fluid to actuate the valving mechanism. They require the minimum pressure differential specified for proper valve operation. 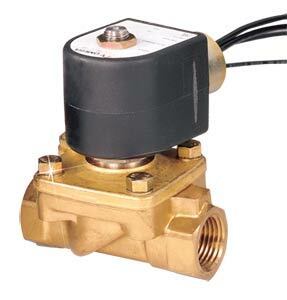 A direct-acting, normally closed solenoid valve is an integral part of the pilot-operated valve and is used to affect the balance of pressure above and below a diaphragm or piston.